Tune your internet radio dial to Doc Thompson's Daily Mojo and fill your cup with Doc's signature coffee. It's the perfect marriage of coffee & bacon, with just a hint of maple thrown in. Doc Thompson's Bacon Blast will give you the boost you need to start your day off Right. 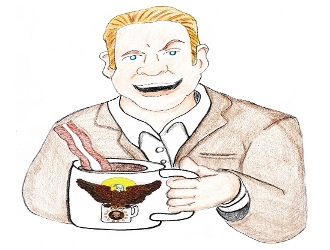 We've used some alliteration in our description of Doc Thompson's Bacon Blast - we've focused on providing a quality coffee instead of an overwhelming fake bacon taste. We do offer Bacon Blast in whole bean but it will have less bacon flavoring than ground Bacon Blast.